Ilene Warner-Maron, a nurse, listens at the podium while a panel discusses the dangers of guns and older adults with dementia or depression. A photo of Warner-Maron’s mother and her gun served as a backdrop. 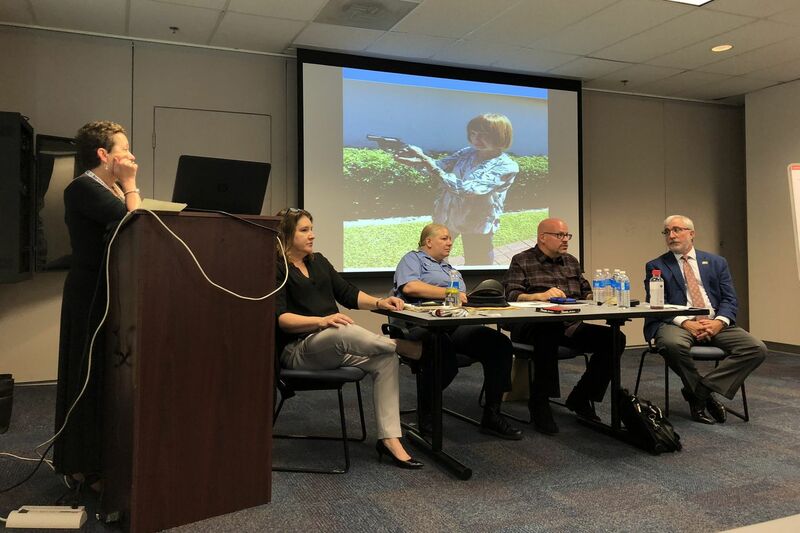 Ilene Warner-Maron, a nurse who specializes in geriatric cases, opened a discussion on gun-owning elders with dementia, depression, or other serious infirmities by showing a picture of an 87-year-old woman gripping a gun in both of her outstretched hands. The woman, Warner-Maron told a full classroom this week at Philadelphia Corporation for Aging, is her mother. She weighs 105 pounds and lives in a gated community in Boca Raton, Fla.
"I cannot get my mother to give up her gun," Warner-Maron said. The panel of experts with her, which included two Philadelphia police officers, did not have easy answers. It can be even harder to get elderly parents to give up their weapons than their car keys, they said. When possible, subterfuge may be the best option. "It's tough to get somebody who cares about their firearms to give them up," said Rick Brehant, a Philadelphia police officer in the gun permit unit. While Philadelphia has some extra rules surrounding gun ownership, "Pennsylvania is a gun-friendly state," he said. Warner-Maron led a panel during PCA's annual regional conference on aging, which drew nearly 550 professionals this week. The subject of guns is important, she said, because advanced age raises the risk for both dementia and depression. Dementia can sometimes make people paranoid or unable to recognize caregivers or even close family members. Several years ago, a PCA caregiver was shot by a longtime patient with dementia. A Pew Research Center report last year found that one-third of Americans over age 65 own a gun, meaning that older adults have the highest rate of gun ownership. They also have the highest rate of suicide, with older white men especially likely to commit suicide. More than 70 percent of older adults who kill themselves use guns to do it, according to the U.S. Centers for Disease Control and Prevention. Among people with dementia, firearms were used in 91 percent of suicide deaths. The FBI reported people over 65 were responsible for 238 homicides by gun in 238. Yet adult children and doctors are often more worried about whether the elderly can safely drive. "If we're that concerned about driving," Warner-Maron said, "shouldn't we be equally concerned about issues involving guns?" She thinks doctors should routinely ask patients with dementia or depression and their caregivers whether there are guns in their home and whether the guns and their ammunition are stored safely. Warner-Maron's mother does not have dementia and lives independently. She thinks the gun could protect her, but also enjoys target practice with her friends. "All my friends have guns," she tells her daughter. Warner-Maron, meanwhile, is worried that the recoil from the gun could knock her mother down, let alone a bad guy who could easily steal the weapon from her. "She could be so easily victimized by the very gun that's going to protect her," Warner-Maron said. There's little she can do to wrest the gun from her cognitively intact mother other than reason with her, perhaps pointing out that statistics show that people are more likely to be shot by their own weapon than they are to use it for protection. But, even if a parent has dementia, even if she is losing her sight, a family in Pennsylvania can't get much help from law enforcement if they want to get a gun out of the house, with a couple of exceptions. It is possible to take away an impaired person's right to carry the gun in public, but the bar is much higher for removing it from the home. Someone who is forcibly admitted for psychiatric treatment, which can only occur when they are a danger to themselves or others, cannot have a gun, Brehant said. Guns can be removed from the home in some domestic-violence situations and when the older person has a court-appointed guardian, said Jennifer Spoeri, director of older-adult protective services at PCA. To qualify for that, the person must be at imminent risk and incapacitated by something, plus lack a responsible caregiver. Brehant said a doctor can report a medical condition that could interfere with safe gun use to the permit issuing authority — the Police Department in Philadelphia and the Sheriff's Department in most other counties. They can revoke the license to carry, but won't remove the gun from a home because of dementia. A worker in the audience said that one of her gun-owning clients is paranoid and blind. She thinks she has dementia. The woman's children have resisted taking the gun away. "I would be leaning on those kids hard," Spoeri said. Tracy Lewis, a victim advocate with the Police Dpartment, said officers can only take guns away if they were used in a crime, someone held a gun while threatening to use it, or the gun is believed to have been used in a crime in the past. "It really has to be a physical threat," she said. Warner-Maron said families may have to be a little devious with people who have dementia. If someone won't give up a gun voluntarily, they may let a relative "borrow" it or take it for cleaning. A professional can disable the trigger. Lewis said a neighbor in her 80s knocked on her door one day holding a brown paper bag. "I have something for you," she said. The bag held a loaded revolver. She said her husband couldn't handle it anymore and she didn't know how to unload it. Lewis kept it. Brehant said his family worried about his Uncle Harry, who, in his 80s, had Parkinson's, "medication fog," and Alzheimer's. He wouldn't give up his guns, but his wife convinced him to get a safe. Brehant and other relatives went for a visit. Uncle Harry took them to the 10 guns he could remember. They found five more. They put them in the safe and showed him the combination. Then, they changed the combination. Uncle Harry, who has since died, never discovered what they had done.